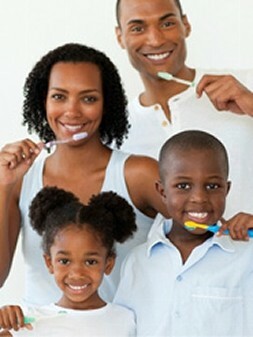 Our family dentists provide a wide variety of services for any tooth health and appearance needs. Our cosmetic dentists are available for orthodontics, including Invisalign™, as well as teeth whitening for special occasions. Your total mouth health is our goal, and we are here to help you with all aspects of keeping your teeth and gums healthy. We use the latest in dental technology to diagnose and treat any dental challenges you face, while helping you with the fundamentals of routine dental care. Our smiles speak for themselves, and our friendly office staff will make you feel right at home! Regular dental care is one of the most important ways to maintain your healthy mouth, and regular cleanings and checkups will prevent small problems from becoming major issues. Building dental hygiene habits at a young age is the key to mouth health that lasts a lifetime. Unfortunately, children can often be nervous about going to the dentist. Our pediatric dentist is friendly and can easily help your child become accustomed to going to the dentist. We are proud of our pain-free family dental services to reduce the “fear factor” of dental care. Your children will also benefit from our careful patient education, which will answer the “why” of dentistry and help them understand the importance of daily brushing and flossing. Cosmetic dentistry is an important part of our services. A great smile is an important part of your confidence, and you deserve to look your best. We have a full range of cosmetic dentist services, from convenient orthodontics to speedy teeth whitening. Our dentists are proud to offer the Invisalign™ teeth straightening system for teenagers and adults. This system allows you to get a well-aligned smile invisibly, often in less than a year. Our smiles speak for themselves, and our friendly office staff will make you feel right at home! Are you looking for a family dentist in Raleigh area? Premier Dentistry of Wake Forest caters to patients of all ages and accepts many kinds of insurance. Contact us today from Wake Forest, Raleigh, Rolesville, Louisburg, Youngsville, Franklinton, Oxford, Butner, Zebulon, Wendell, Henderson, or Knightdale, North Carolina.